Owlboy is an indie darling that made its PC debut back in 2016, before flying to other platforms like the PlayStation 4. Now it’s preparing to land onto store shelves, but not right away. Owlboy Limited Edition is facing its second delay in North America. 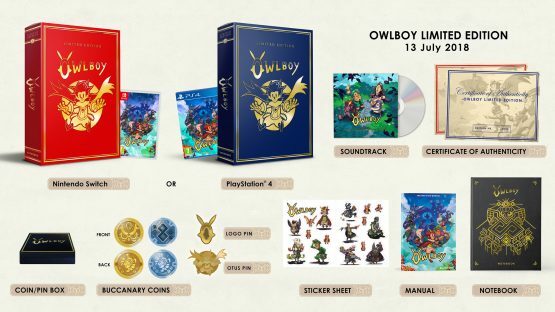 Originally slated to appear on the PlayStation 4 and Nintendo Switch on July 13, 2018, the Owlboy Limited Edition’s first delay occurred in order to ensure a worldwide release. However, this won’t happen. Owlboy Limited Edition won’t arrive in the United States or Canada until September 28, 2018. Fortunately for everyone else, this collector’s edition will still arrive in other regions on August 31st, 2018. Owlboy is already available digitally. Again, the collector’s edition releases for the PS4 and Nintendo Switch on September 28, 2018 in North America and on August 31, 2018 everywhere else.